In Middle/High school, my friend Josh and I were firmly in the musical minority. While the musical tastes of others impulsively changed with the charts, we were staunch in our love for classic Blues. That love was engendered by Eric Clapton. As teens, we created a “Clapton is God” AOL blog page expressing our adoration for the guitar legend. It was crudely done, but the purpose was clear. While others looked up to Eminem, we looked up to Eric Clapton. Thus, when Josh and I have the opportunity to see Eric Clapton, we do. We are only in our early 20s, though, so we have seen Clapton three times (we are lucky that we are located in a concert hub like New York). Soon we will add a fourth concert to the list, and, wow, what a concert it will be. I will say I am not sure any concert can trump the Eric Clapton and Steve Winwood show at the Izod Center (6/10/09). That concert also sparked my first review for the Music Court (can be accessed there). The Crossroads Guitar Festival 2013 is coming to Madison Square Garden in April of 2013. Oddly enough, the first night of the two-night event falls on April 12, my friend Josh’s birthday. Quite a present, indeed. 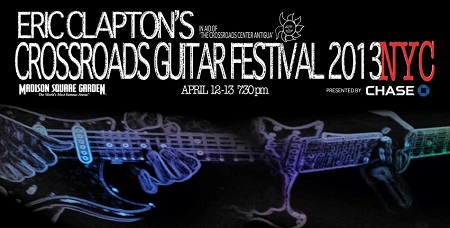 The Crossroads Guitar Festival is a triennial musical festival and benefit concert that features a hand-picked line-up of guitarists at Clapton’s discretion – so you can be assured it will be epic. The line-up has transformed since the first show in 2004. In 2010, the Festival was held in Chicago (also held in Illinois in 2007), and many of the artists that appeared in the 2010 show will perform at MSG in April. Where do I begin? Seriously, it is like Thanksgiving dinner. There is turkey, stuffing, and sweet potato, and you just don’t know where to start. Luckily, the MSG stage will serve as a large plate and the audience will be able to feast their eyes AND ears on the music of these great musicians. Some artists serve obvious excitement. B.B. King, Buddy Guy, Jeff Beck, and Albert Lee are legends. The Allman Brothers Band will make their first appearance at the Festival, and that has serious blow-your-socks off potential. Can I please ask for a rendition of “Layla” with Derek Trucks reprising Duane Allman’s role on slide guitar? I am also excited to see rising star Gary Clark Jr. play upon his Jimi Hendrix influence. I can just keep on saying I am also because I am excited about all acts. It should be noted that all acts will NOT appear on both nights. With the amount of talent present, though, you will listen to something great! You will also be supporting a worthy cause. The Crossroads Centre, Antigua, was founded in 1998 to provide treatment to addicted individuals. As Clapton was once afflicted with addiction, this is a personal cause. For those with tickets to the show, there will be free admission to a “Guitar Center Road to Crossroads Exhibition” which will feature a diverse display of guitar-related memorabilia including the “Legends Guitar Walk,” which will display some of the most expensive guitars in history. It’s like a mini Rock n’ Roll Hall-of-Fame exhibit on the Terrace Level of MSG. The exhibit opens at 6:30 p.m. on Friday, April 12 and 6 p.m. on Saturday, April 13. Like the Guitar Fest on Facebook and follow it on Twitter. TICKET INFORMATION: Tickets go on sale to the public this Friday (11/30) at Noon EST. They can be purchased at www.ticketmaster.com. I will be on Ticketmaster frantically refreshing the page for tickets at 11:55 a.m.! See you there. I saw Eric Clapton and the Allman Brothers (though not on the same night) about 35 years ago. Both put on amazing performances. It sounds like it will be a fantastic show! Thanks! I agree. Hopefully I can get some tickets!